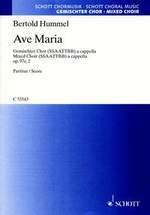 This "Ave Maria" is an arrangement made by Bertold Hummel in December 1997 of his motet "Gegrüßet seist du, Maria [Hail Maria]" which he had composed on 20 May 1993 with a dedication in memory of his deeply religioues sister Erika. This Latin version was dedicated to the Cathedral Music Master Siegfried Koesler in Berold Hummel also co-founded the Bruckner Festival in Würzburg together with Koesler and Erwin Horn, a specialist in the opening section of their sorks and Bertold Humme quotes Bruckner's final cadence on the name of Jesus prios to the Amen. The text of the so-called Angelic Salutaion is based on the Bible passages from the Gospel of St Luke (luke 1, 28b, 42) which was extended over the centuries with additions such as Jesus (14th century) and the Invocation to Mary. This text was included in the Breviary of Pope Pius V in 1568 which officially confirmed its status as a prayer.